In the old days bad guys were black hats and rode black horses. Today bad guys wear black hoods, have badges and work for the government. This is a photo from La Voz around the week of March 27, 2009. 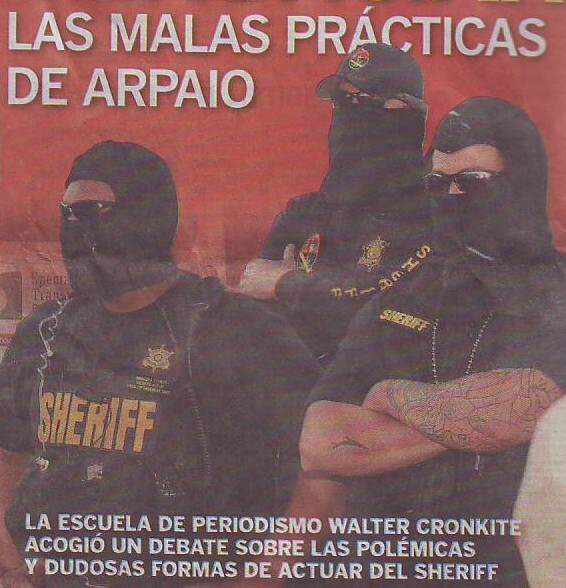 The bad guys in the photo are Sheriff Joe's goons. They are probably on one of Sheriff Joe's unconstitutional immigration sweeps. In these sweeps, Sheriff Joe's goons stop anyone with brown skin and make them prove they are not a Mexican. Of course it is illegal and unconstitutional for cop to stop some one for the alleged crime of "having brown skin". But that doesn't stop these racist criminals wearing black hoods from doing it. After all they are cops and have a gun and a badge and do anything they want!